Today we are introducing a very simple attractive Spa therapy css pricing table design is a best solution for your websites to show your type of plans and price of plans on your website. This is very simple and clean responsive spa therapy pricing table box created using bootstrap and css, use different-2 color of each boxes. Here we are Spa therapy css pricing table template with four common boxes use different-2 color for each boxes which make attracting section of your template. This is spa therapy css pricing table design 100% responsive cross browser, compatible on all devices, displayed on all screen sizes. It is entirely built in HTML5, CSS3. Make it yours now by using it, downloading it and please share it. 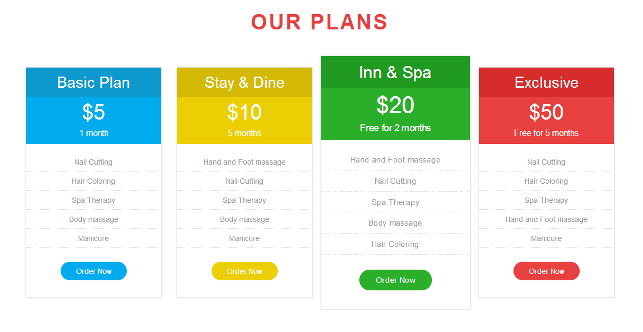 Template Name : – Spa therapy css pricing table flat bootstrap responsive design free download. Keywords : html pricing table templates free download, bootstrap pricing table template free download, html css plan pricing table templates free download, responsive pricing table bootstrap, stylish css pricing tables, pricing table html template, bootstrap pricing table template free, pricing table template bootstrap, attractive pricing table template, on mouse hover effect pricing table template.